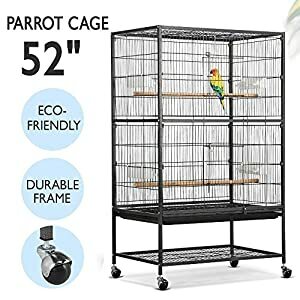 How to Choose the Right Bird Cage? 1. What size can comfortably fit your bird? 2. What is the type of material is used to construct the birdcage? 3. Are the cage bars well spaced? 4. How easily can you be able to access inside of the cage? 5. Where to place the birdcage? 2. 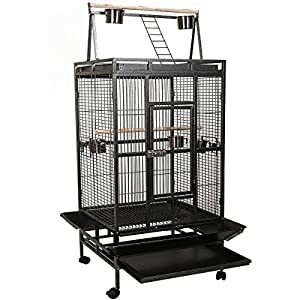 Prevue Hendryx Pet Wrought Iron Flight Cage. 8. Pali Place Bird Cage and Flight Cage. Do you have a large bird or planning to get one? If so, you will need to have a look at the best bird cages that can comfortably accommodate your birds. It is not right to put a big bird into a small birdcage because the bird will not be comfortable. Your birds will need to have a room that is large enough for them to stretch their wings comfortably. They also require additional space in the cage to walk around and play comfortably. Also, remember that accessories such as feeders that you put in the cage will also take up some space. If you are searching for a new birdcage, then you need to ensure that you get the right one. This article discusses bird cages subject into details and will teach you how to choose the right bird cage for your bird pet. The choice of a bird cage should be approached with all the responsibility because the bird will have to spend all its life in the cage. A bird cage that is too tight, with incorrect shape and constructed with hazardous material can adversely affect your bird's health, its plumage and even its lifespan. Below are factors to put into consideration before buying a cage for your pet. 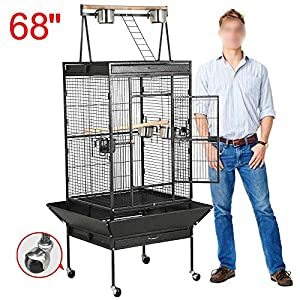 A bird cage should be large enough to accommodate your bird with no struggle. A big bird like a parrot that flies tens of kilometres a day cannot reside in a cage equal to that of a hen. Also do not forget that in the same bird cage, you will need to place various perches, feeding troughs, ladders and other toys and they will take up some space. Therefore, whenever possible, it is better to select a cage that will comfortably accommodate your bird. For comfort, a pet needs a dwelling place where it can freely jump from the perch to the perch freely. The next criteria that you should consider before buying a cage for your bird is the material used to make the cage. Optimally, If you want a metal cage, it is better to choose stainless steel or ordinary steel that coated with a polymer coating or durable, non-toxic paint. The reason behind this is to avoid it from rusting and posing health dangers to your pet. The coating material should also be safe because your pet may most likely try to chew on the metal. You should also try to avoid wooden cages because some birds tend to destroy it. When choosing the right bird cage for your bird, also consider cage bar spacing as an equally important factor. In many cases, birds get their heads stuck between the bars due to the incorrect bar spacing. Bar space is indeed something that you must ensure that it is made in the right way before you buy a bird cage. When cage bars are so close, a bird may fail to grasp the bars properly while climbing and can harm itself by getting its feet caught in between the bars. A proper bar spacing should be between half to three-quarter of the space. Your cage door should allow you to access inside the cage without any struggle. Having access into your bird’s cage is very important because you will be required to frequently get into it when feeding your bird and cleaning the cage. There are various types of cage doors; a door that opens to the side, a door that opens upwards, a door that opens from top to bottom and guillotine doors that slides up and down. The best option for your cage is the door that opens to the side or a door that goes down.Avoid guillotine doors (those that slide up and down along the bars) because they create a chance for the restless birds to escape and it can also fall on the bird's neck. The door size should be in such a way that your hand can easily fit into it. To prevent your bird from feeling lonely, place the cage at a place where the bird can be able to see and interact with people easily. It is also not good to have a lot of noise in the room as it will make your bird anxious and consequently lead to a health issue. Ensure that the cage placement is in such a way that it can be able to hide when it feels insecure. Placing the cage against the wall or at a corner will help your bird to hide whenever it feels threatened, and this will contribute to your bird well being. Also, try to ensure that the cage height is at the level of your chest to enable you to interact with the bird daily. Placing your cage too high will make the bird feel isolated while setting it too low will make it feel anxious. Putting the bird in the kitchen is also not advisable as it may get too hot. Rapid climatical change usually is not good for your bird's health. Do not place your bird’s cage directly in the front of your house window as it can be scared by hawks, storms and even dogs. Instead, put it strategically facing the window for it to have a partial view of the window. Wrought iron bird cages offer quality craftsmanship at an affordable price. The cage comes with four stainless steel cups, two wood perches, a cage stand, a play top and a rounded seed guard. 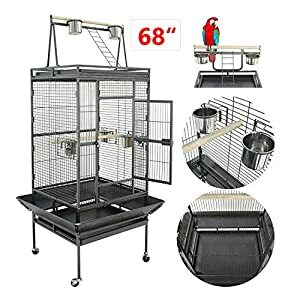 Your bird is more secure in this type of a cage since it has a heavy-duty push button door lock that ensures that your bird does not escape at any conditions. This cage is coated with a non- toxic finish that makes the cage more durable and safe for your bird. Its stand makes it stable. It also has a play top where your birds can rest and enjoy themselves. It is sized 36-Inch long, 24-inch width and 66-inch high with 3/4-inch wire spacing which makes it large enough to accommodate large-sized bird. A rounded seed guard is also included in this type of a bird cage. Has a heavy duty button lock that enforces security. It has a play top where your birds can rest and play. This cage has no clear assembling instructions. 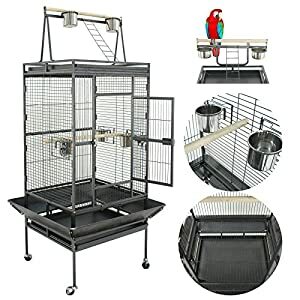 Prevue Hendryx Pet Wrought Iron Flight Cage is one of the best big bird cages in the market today. This cage comes with four plastic cups and three solid wooden perches. 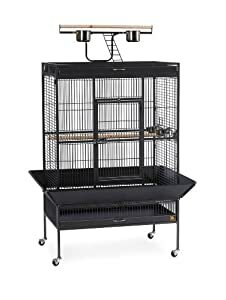 Prevue Hendryx Pet Wrought Iron Flight Cage is sized 37-inch long, 23-inch wide and a 60-inch height with half an inch wire spacing. It can hold enough food for more than one bird. It is equipped with a slide-out plastic tray at the bottom that traps bird droppings and feeds, hence making cleaning the cage easy. It has an inbuilt shelf that facilitates additional bird food storage. The cage is constructed using a steel mesh that is coated with a non-toxic pet safe powder. This non-toxic coating protects your bird from health hazards. It has a non-toxic pet safe powder coating. Has a seed guard that traps bird droppings and feeds. Its feeding cups are made of plastic material. Are you looking for a big bird cage that will last longer and hold your big birds? This cage fits your needs best. It has five stainless steel bowls that hold enough feed for your birds, aside with that, it has two wooden perches and a top playing area that is equipped with a ladder that acts as your birds play-ground. Cleaning this type of cage is an easy task because it has a removable button tray that is easily cleanable. Its tray holds falling feeds and bird’s droppings to ensure that your house is always clean. The cage comes with lockable doors that keep your birds secure. It is durable since it is constructed using a premium metal with an inbuilt solid structure. It is also sturdy enough to hold your bird’s bites and harsh weather conditions. It has a wire spacing of three-quarter inch hence keeping your birds more comfortable. Has a tray for holding falling dropping. This bird cage fits different types of bird species. It has a length of 23.5 inches, a width of 23.5 inches and an interior height of 54.25 inches. Its bar spacing of 0.36 inches fits different bird species. The cage is coated with a heavy duty non-toxic coating with excellent anti-rusting ability. Cleaning it is very easy as it is equipped with a metal tray that offers you convenience while cleaning. Feeding your bird is also an easy task when using this type of cage as it has big enough plastic feeding bowls. It also has big enough doors that allow you to feed your birds with ease. Assembling it is easy; it comes with a definite step by step assembling instructions from the manufactures. You can also refer instruction procedures on YouTube. It can allow different species. Cage access is easy due to its large doors. This cage has a beautiful finish. Not suitable for huge birds. Nova Microdermabrasion cage is one of the best selling cages in the market. This cage is not easily deformed or damaged because it is constructed using premium metal that forms a built-in solid structure. 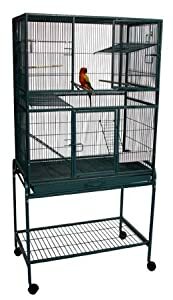 It is a stylish and straightforward cage with an ample space that can accommodate several birds comfortably. Its frames are coated with an antirust coat that not only ensures that the cage is smooth but also ensures that the cage does not rust. It is sized 23.81-inch length, with a 22.04-inch width and a height of 31.88 inches. Many people use it as a decoration in flower shops due to its beauty. This cage has a pyramid top play area that has a ladder, five stainless steel cups, three feeder doors that allows you to feed your birds easier, hardwood dowel perch to stand on and an interior wooden perch that act as a resting place for your birds. Cleaning this cage is an easy task due to its slide-out tray that is easily removable. Relocating this cage is also an easy task as it has four strong swivels casters that will help you to move it around without noise. Can be used as a decoration in flower shops. It comes with a pyramid play top. It is coated with an antirust coat that prevents it from rusting. Can be difficult to assemble alone. This cage is among the most spacious bird cages. It is sized 30.8-inch length, with a 20.5-inch width and a height of 37.2 inches. This bird cage is constructed by a sturdy metal wire coated with a non-toxic finish. The cage has three perches that the birds can sit on and play. The four large feeding trays provide the best for daily food and water needs. Its four wheels enable you to move it with ease. Cleaning this cage is an easy task as it has a slide out-out tray that helps in keeping the mess inside of the cage and off of your floor. It is easily washed when dirty to keep your bird’s home fresh and clean at all times. The cage is ideal for medium sized birds and makes the perfect home for multiple parakeets, canaries or finches. 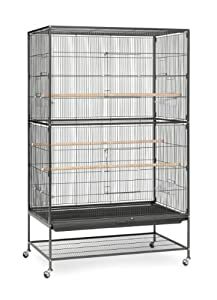 Consider buying this cage, and your birds will be living large in their roomy new place! It is made of sturdy metal wire coated with a non-toxic finish. It has large feeding trays. Has more than one doors that allow multiple access to the birds. Can accommodate more than one bird. Assembling the cage is a hard task. Giantex birdcage is one of the modest bird cage available in the market. It has a lockable wheelset that can help you move the cage conveniently. Its wheels make the birdcage location flexible, and the lockable design allows you to fix the cage on your place of choice. It is roomy and can hold several birds comfortably. It is made of high-quality iron wire, which makes the cage more durable and reliable. It is easy to feed your birds using this cage as it has three bird feeding doors. The cage has straight forward illustrations and descriptions for assembling procedures. It has lockable wheels that make it flexible. It can hold several birds due to its size. It is durable since it is constructed of high-quality wire. 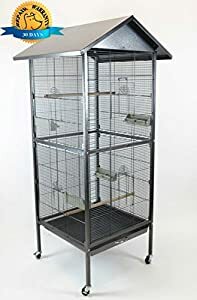 Pali place birdcage and flight cage is a roomy and value-packed cage that enables you to keep your birds fantastically. It has a bar spacing of a half an inch which is recommendable. It measures 30-inch length, with an 18-inch width and a height of 62 inches. You can easily keep this cage clean as it has a removable tray and grate that traps all the falling bird's droppings. It comes with a plastic seed and water cups that facilitate feeding your birds. This cage can be easily assembled and can be available in different colours, ranging from white, black, silver or even green. It has enough space for your bird’s. Has a removable tray and grate. It is available in different colours. The cage has no divider. ZENY bird cage is made up of a steady and robust metal mainframe that makes the cage more durable. The cage is coated with a non-toxic finish that prevents the cage from rusting. It has a 360° Swivel Casters that enhances cage mobility and stability. It is big enough to hold several birds. It measures 23.8-inch length, with a 22-inch width and a height of 34.3 inches. This cage has three feeder doors that allow natural feeding, three large interior stainless steel feeding bowls, four sturdy swivel casters and two locks for mobility and stability. You can easily relocate this cage into the location of your choice because of its 360° Swivel Casters feature. The cage has a lockable design that will allow you to fix the cage in specific areas. It has a large room, which can hold several birds with enough space for them to play. It is flexible and can move in any direction due to its 360° Swivel Casters feature. The cage is coated with a non-toxic finish. It has enough stainless steel feeding bowls. Cage assembly procedures are quite complicated. After you have bought and installed your bird's cage, you need to come up with a cleaning and maintenance routine. It is always important to clean and disinfect your bird's cage regularly to protect your birds from diseases. You can do your cleaning monthly or weekly depending on the size of your bird's cage and the number of birds that are there. It is also good to clean the bird cage using a strong disinfectant that is strong enough to kill all viruses and germs. Make sure that the disinfectant does not harm your birds. Finally, don't think twice to invest money for a bigger cage. It's totally for the benefit of happiness and well-being of your birds.